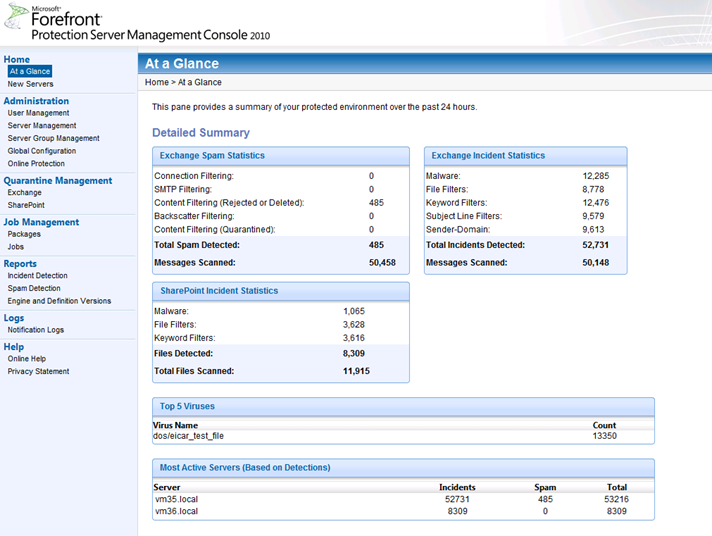 The Forefront Protection Server Management Console 2010 (FPSMC) has been released to web on December 17, 2010. Forefront Protection Server Management Console 2010 (FPSMC) is the multi-server management solution that is designed to manage Forefront Protection for Exchange (FPE) and Forefront Protection for SharePoint (FPSP) servers within the organization. FPSMC is a refresh of the Forefront Server Security Management Console that is currently available to manage Forefront Security for Exchange Server 2007, Forefront Security for SharePoint 2007 and Antigen 9 products. FPSMC is a free download that does not require any additional licensing. For deployment and operations guidance, refer to the FPSMC articles on TechNet. You can now manage multiple servers running Forefront Protection for Exchange or SharePoint thanks to the multi-server management Script Kit. You can download the script kit for free at the Microsoft Download Center, subject to acceptance of license terms. In addition to the ability to manage multiple Forefront Protection Servers from a single location, this tool provides easily extensible command-line scripts that help enable server discovery, configuration deployment, and integration with existing management technologies. It also offers basic reporting capabilities to detect configuration drift and monitor server statistics.